I brought a cheap Bluetooth headset from Home bargains, only cost £3.99 mainly for use for hands free calling when in the car, but also I thought for using for general sound from my device. Well l I didn’t realize that this device and like a lot of the cheap Bluetooth headsets they don’t support A2DP profile. What this basically means is they support the calling audio from your phone, but not the media stream ie music or sound from apps. The use for general audio I wanted to use this headset for was mainly for listening to the radio / podcasts / YouTube (mainly voice) and audio from games / emulators. Didn’t need to be great audio as for the most of the time will use it is while we are in living room and the missus is watching TV and I’m playing quick game on my tablet, I like sound when playing games. Not the annoying sound of candy crush etc as don’t play those, but do play mainly psp games through emulator and with those type games the sound does add to the game and don’t get the full enjoyed if the sound is muted. 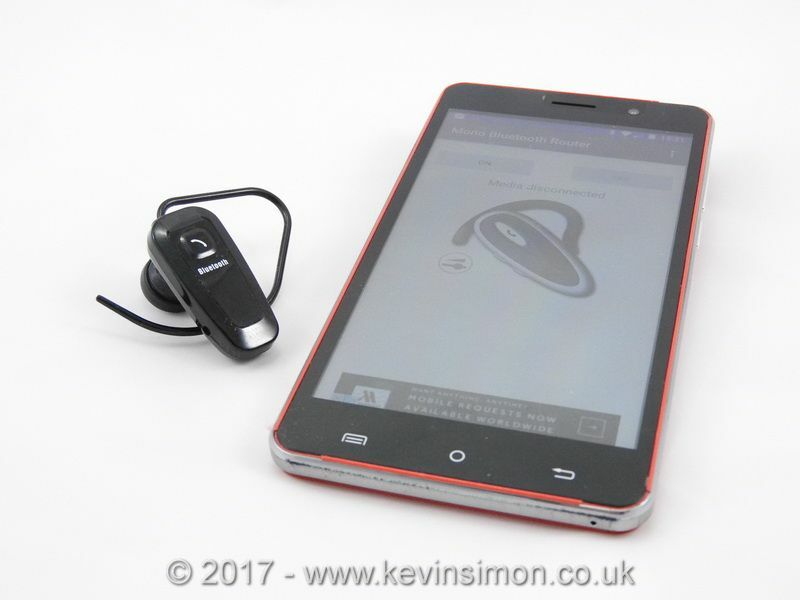 As this Bluetooth headset dosnt support A2DP music streaming I looked around if there was any apps that would re route the audio stream to the calling profile and was surprised there was a good few within the google playstore mixed between free and paid apps. After trying a good few on settled on either of these two Bluetooth mono router or Dynamic Media BT Mono Router either work well, but the main one using so far is the Bluetooth mono router. To use the app all you do is open the app and tap on the “on button” , as long as you have the headset synced. The app shows that it is running in the notification area. Now any music etc will play through the Bluetooth headset. To stop the service just just tap the “off button” within the application. Now using this type of method there are some disadvantages the main one is sound quality as the sound will only be in mono not stereo. Which that does make the sound quality low, so not that great for listening to music. The sound is more like the sound from an old AM radio. For listening to music you are better off getting a proper set of Bluetooth earphones. But using this option does mean you can use a cheap Bluetooth headset. For me personally it works as mainly I listen to podcasts, talk radio and in game sound so just about good enough for that. I wouldn’t go out and buy one of these cheap headsets for anything other than calling, but if you have got an old headset great to get a bit of use out of it.